Whether you’re allergic to a certain type of flower or you simply want to create a wedding bouquet that’s as original as you are, there are many reasons to decide to use an interesting and unique wedding bouquet as opposed to the traditional all-flower bouquet. 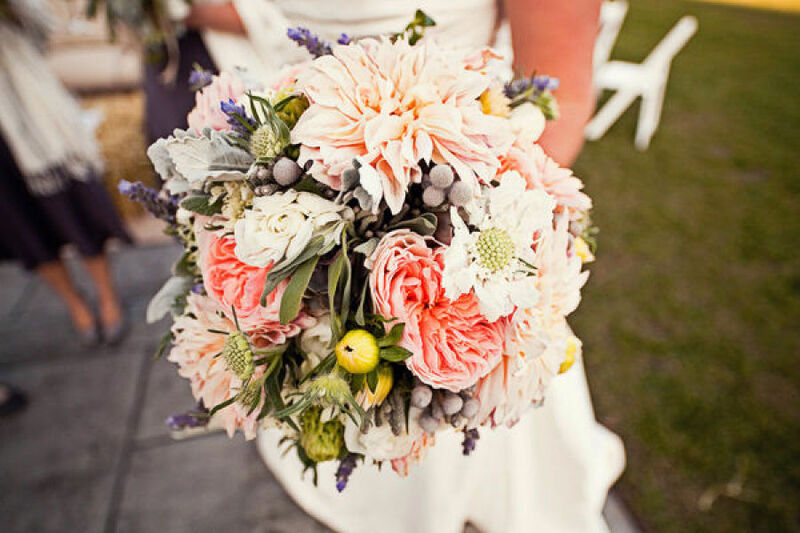 When the time comes in your wedding planning to organize your bouquet and your wedding party’s boutineers and bouquets, try out some of the following ideas to see if a little twist on a traditional wedding bouquet could be just the addition you want to make your wedding truly yours. If you’re looking for a bouquet option that looks semi-traditional but still has a little unique flare, creating “flowers” from a different material may be perfect for you. Brigitt Hauck, a contributor to Real Simple, shares that some of the most common alternative bouquet materials to transform into flower shapes for a bouquet are fabric, pinwheels, and paper materials like books and maps. Consider your own personality and the theme or vibe of your wedding when picking an alternative material to create your bouquet from in order to ensure this piece fits seamlessly into the entire style you’re going for. While flowers can be stunning in a bouquet, some brides may be looking for something with a bit more pizzazz. For spicing up a bouquet, Pauline Millard, a contributor to SheFinds.com, recommends creating a bouquet-shaped piece that you can thenadorn as you desire. Some items you may want to include in your glitzy bouquet could be pearls, crystal, wire, brooches, rhinestones and more. Using materials like the ones mentioned to create a glamorous focal point may be an idea you want to use if you have a simpler dress that could use some extra bling to create the ideal look you’ve been searching for. Regardless of whether your wedding is taking place in the chilly Montana mountains or the humidity of Atlanta, wedding flowers of a non-traditional sort may be another option that could better match your environment, style and budget. Try looking for various plants, fruits or even vegetables that combine the colors of your wedding with the personality of your event. This may mean including things like berries or other edibles into the mix, creating a truly unique and beautiful wedding bouquet that you’ll always cherish and your guests will never forget. When it comes to your wedding bouquet, you want to choose something that will complement you, your dress, and the overall mood of your wedding. Consider the options mentioned above if you think you may be leaning toward a more interesting and unique bouquet for your upcoming wedding. Happy planning!